Our 540525 All 316L Stainless Steel Mercury Silent Choice Header is the same as our 540524 All 316L Stainless Steel Mercury Silent Choice Header but it's only 33" in overall width for twin engine applications. 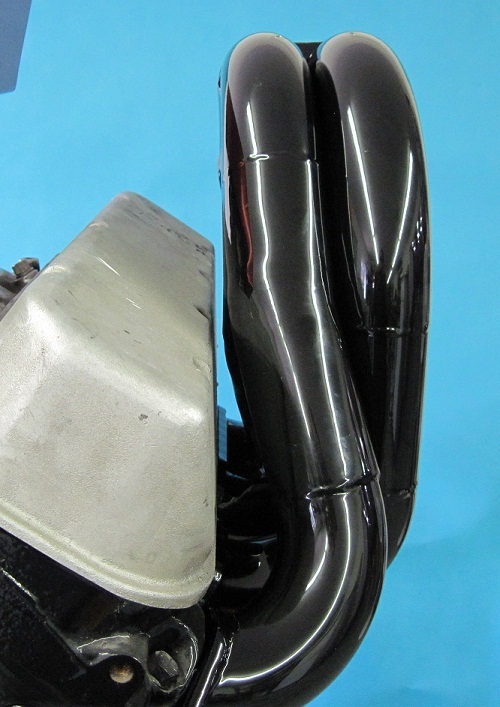 This Mercury fresh water header incorporates a 2" primary tube (1 7/8" I.D.) The 2" primary tube header has been Dyno tested with our 632 cubic inch Chevy test engine with outstanding results. For more info click here. The standard header outlet points to the stock Mercury location at the transom. This header is the most susceptible to reversion because of its short collector. It should be noted that the opening size of the port that runs through the gimbal housing to the propeller is 2" X 2 3/4". So if a high horsepower or large cubic inch engine is used, the Silent Choice valves can only be closed at low RPM.